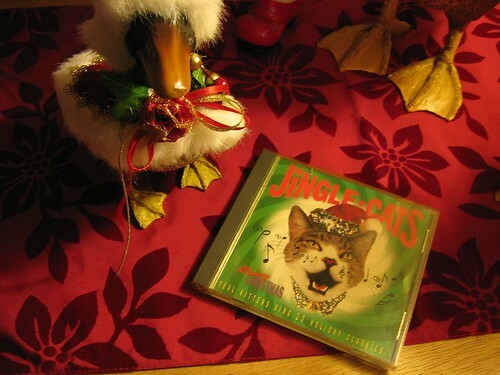 Stupid Idea: You know those Christmas records where they do Christmas records with dog barks or cat meows? Usually they’re credited to the Jingle Dogs or the Jingle Cats? And the early one was done with actual tape splicing and stuff where they have the actual dog barks and noises that are in the actual right notes, so that’s kinda cool, but they’ve done more recent ones where it’s just a sampling keyboard, so it’s kind of cheating? But even though it’s sorta neat from a technical aspect, it’s still pretty damned annoying anyway? The thing I always wanted to do, and I think it’s kind of in the same spirit of say, the EZ-Listening Disc, is to do an album of DEVO songs in Jingle Cats style. I really have a feeling that Mark Mothersbaugh would dig it. Or at least in that “I’m glad this exists” sense. I can’t imagine he, or anyone really, putting it into high rotation, but it’d be good for mixtapes and that sort of thing. And really, don’t you think cats meowing the opening of “Uncontrollable Urge” would be kind of weirdly awesome? All “Mow-mow-mow-mow-mow-mowmowmowmowmowmowmowmowmowmeowwwww!” followed by “MEOW MEOW! MEOW MEOW!” as the chugging rhythm guitar line? Why I Never Did It: I don’t want to actually compile a bunch of cat meows in the right key to do it the real way, and I don’t think I’m nearly a good enough keyboardist to do it the cheater-way. That and it’s probably just me. John Lydon almost joined Devo in 1978? Well, I’ll be. Watch This Montage Of Cats Acting Like Humans Right Meow! A Perfect KingCast Halloween/DEVO Moment.